NAMED BY THE Cherokee Native Americans, the U.S. state of Tennessee, which is officially known as the Volunteer State, is celebrated throughout the world as the home of American country music. Tennessee is bounded on the north by KENTUCKY and VIRGINIA, on the south by GEORGIA, ALABAMA, and MISSISSIPPI, on the east by NORTH CAROLINA, and on the west by ARKANSAS and MISSOURI. The MISSISSIPPI RIVER runs along the western boundary of Tennessee. 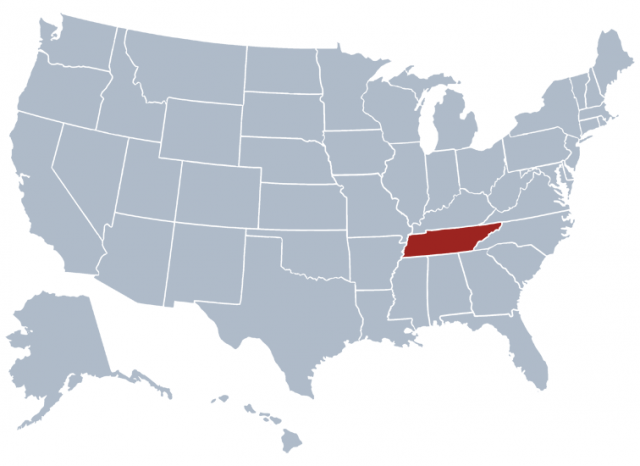 The total area of Tennessee is 42,146 square mi (109,157 square km), making it the 36th state in size. Tennessee’s largest cities are Memphis, Nashville (the capital), Knoxville, Chattanooga, Clarksville, Murfreesboro, Jackson, Johnson City, Kingsport, and Franklin. In this inland state, only 926 square mi (2,398 square km) are covered by water. Tennessee’s major rivers are the Tennessee, the Mississippi, the Cumberland, the Clinch, and the Duck. Since most of Tennessee lies within the Mississippi River Basin, natural waterways within the state generally drain either directly or indirectly into the Mississippi River. Tennessee has 25 artificial lakes and reservoirs that have been created by damming river waters. Tennessee lakes include the Kentucky, the Norris, the Chickamauga, the Cherokee, and the Tims Ford Reservoir. Tennessee’s average elevation is 900 ft (274 m) above sea level. The highest point in the state is 6,643 ft (2,024 m) above sea level at Clingman’s Dome, and the lowest point is 128 ft (39 m) above sea level at the Mississippi River. The state is approximately 440 mi (708 km) from east to west and approximately 120 mi (193 km) north to south. The climate of Tennessee is temperate, and the state experiences warm, humid summers and cool, clear winters. Overall, Tennessee’s temperature ranges from the high 20s degrees F (-2 degrees C) in the winter to the low 90s degrees F (33 degrees C) in the summer. Average annual rainfall ranges from 60 in (152 cm) in the mountains to 45 in (114 cm) in more protected areas. Moderate snow is frequent in the winter in Tennessee, but it is not uncommon for mountainous areas to see as much as 15 ft (4.57 m) during winter months. Tennessee is made up of six geographic regions. The Blue Ridge Region of Tennessee is located along the North Carolina border. This area is covered with high mountains, most notably the Great Smoky, Chilhowee and Snowbird mountains. The average elevation is 500 ft (150 m) feet above sea level in this region, which includes Clingman’s Dome in the Great Smoky Mountains. The Appalachian Ridge and Valley Region is a 55-mi (88-km) stretch west of the Blue Ridge Region. This section is filled with fertile valleys interspersed with wooded ridges. The western section of this area is known as The Great Valley. The Appalachian or Cumberland Plateau is located west of the Appalachian Ridge and Valley Region. This plateau is made up of flat-topped mountains that dip sharply into valleys below. Elevations in the area may be as high as 800 ft (243 m) above sea level. Lookout Mountain, located in the southern section of the plateau, is named for the view that it provides of seven states. The Highland Rim, which is made up of an elevated plain with rounded hills known as knobs, lies to the west of the Appalachian Basin. The northernmost section of the Highland Rim is known as the Pennyroyal Region. The Highland Rim surrounds the Nashville Basin, which comprises the fertile farming area of Tennessee. The soils of the Highland Rim, however, are sandy and ill suited for farming. Most of Tennessee is located within the Gulf Coastal Plain, which extends west from the Highland Rim and Nashville Basin. The section is only part of the greater Gulf Coastal Plain that begins at the Gulf of Mexico and continues into southern ILLINOIS. Tennessee’s section of the Gulf Coastal Plain is divided into three sections, stretching eastward from the Tennessee River and westward toward the Mississippi River. In the east, a short stretch of hilly land follows the banks of the Tennessee River. In the west, the land is comprised of rolling hills and streams that traverse the area from Memphis into the western part of Tennessee known as the Tennessee Bottoms. This bottomland has steep bluffs that overlook the Mississippi River. Lowlands, FLOODPLAINS, and swamps fill the final area of Tennessee’s section of the Gulf Coastal Plain, which is known as the Mississippi Alluvial Plain or The Delta, rising no more than 300 ft (90 m) above sea level. Around 50 percent of Tennessee’s land is covered with forests that contain at least 150 species of trees, including ash, beech, elm, chestnut, maple, tulip poplar (the state tree), walnut, cedar, fir, pine, and spruce. Flowering trees include azalea, dogwood, mountain laurel, iris (the state flower), redbud, and rhododendron. Tennessee’s wildlife includes black bear, whitetailed deer, opossum, fox, rabbit, skunk, and squirrel. Songbirds found in the state include bluebird, crow, ruffed grouse, hawk, mockingbird (the state bird), robin, and wild turkey. Migrating birds are common along the Mississippi River. Agriculture dominated the economy of Tennessee until the20th century, when the service and manufacture of new products began to generate a greater portion of Tennessee’s income. Governmental jobs, such as those connected with the nuclear power research and development unit at Oakridge, also stimulate Tennessee’s economy. Tennessee’s most important minerals include bituminous coal, phosphate rock, gemstones, limestone, marble, zinc, sand and gravel, copper, clay, pyrite, and petroleum. Tennessee’s top agricultural products are soybeans, tobacco, hay, cotton, corn, and wheat. The state’s major industries include chemicals, textiles, apparel, electrical products, furniture, leather goods, food processing, and lumber. Tennessee is also a major producer of dairy and nursery product. Tourism is essential to Tennessee’s economy.